To me, Autumn is very much like a second spring. The varied colors of the leaves brighten the sky just like the flowers do in spring and if we get a hint of an Indian summer then that really makes me smile. Temperatures during this time of the year chang gradually from warm to cold so this makes choosing your autumn outfits quick difficult because you don’t want to be too hot but at the same time, you don’t want to be caught without a coat if it rains. I really think that dressing during this season should compliment the autumn colours but also suit the weather conditions. I was recently directed me to the heine.co.uk website to check out what they have to offer for the autumn season and considering its my first look at their website, I’d say they’re a good start to shop for the right outfit for this season! I’ve picked out some different pieces that I like from four key areas- Coats and Jackets because, lets face it, in the UK we’re in need of an extra layer, Boots because they’re an absolute staple for me at this time of the year (for some autumn outfit inspiration, see an autumn look book that I put together here), Jeans– they’re in everyone’s wardrobes and an Evening Addition– something that can instantly dress up an outfit. I live in the North of England and I’m sure I speak on behalf of many people, not just those locally, that during the autumn months, we really need to have a jacket or a coat with us to keep us warm and comforted from the wind and rain. There are three jackets that stood out to me on the website, the first is the Rick Cardona safari jacket which is a khaki, waist length jacket in a gorgeous green shade. This a perfect for those looking to rock the safari or military trend. The second item that I like is the Mandarin denim jacket which is a much shorter cut and more fitting, making it suitable for Autumn days. Denim jackets are always a stable and this one could even be used in the spring and summer months on top of a dress. At the top end of my picks is the pricey Linea Tesini jacket that I just couldn’t resist in this gorgeous mint green. I love it! To me, autumn and winter are the boot wearing seasons. I found so many styles on the Heine website. If you’re into classic brogues in an ankle boot style then these wine coloured ones could be great for you. They’re a classic designed vintage leather shoes but with shoe laces. They look as though they would be pretty comfortable as they look like they’ve got quite a sturdy heel. Another lace up boot that I thought looked great was the B.C. Best Connections Ankle Boots. These have a shearling style lining that would look great with jeans or leggings and knitwear. My favourite of all of the boots at Heine are the Gabor ankle boots. These are gorgeous- they’re a suede mix with a rubber trim and a thermo rubber sole making them look as though they would be so comfortable to walk in. If its Autumn, denim is the way to go whether you’re going out for a walk, shopping or out to dinner. Yes, you can wear denim all year round but there’s something about the autumn that really shows denims multipurpose. During the autumn, I’d really recommend slim leg jeans like the Linea Tesini Jeans as these can be easily tucked into boots without gaping and then you can easily whip the boots off and replace them with some heels for an evening out. Speaking of taking your outfit from day to night, autumn is a time that is very close to the party season and many work places and friends meet up for their Christmas celebrations early in order to avoid the December rush. I’d suggest having a really smart blazer on hand to pop on top of skinny jeans, a cami and heels or on top of your work trousers to take your day time outfit straight into the evening, saving you lots of time getting ready. The Ashley Brooke Event Blazer is great for this as it is a really tailored, eye catching blazer and it’s available in midnight blue and black too. 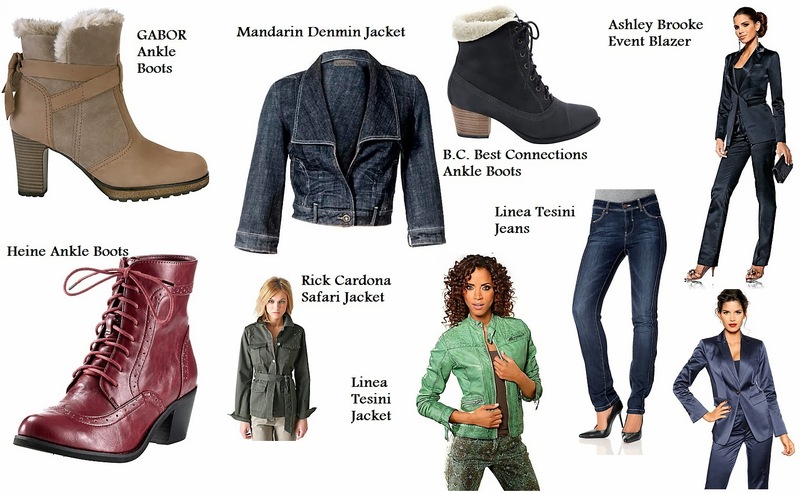 I hope you like my picks from Heine, let me know what your autumn staples are!